I tend to think the Lonely Guidebook has made a nothing lake into a something lake just to have something to write about. Mojo, Ethiopia has running water; they have a public water system that gives chlorinated water to all the homes and businesses. This in a way makes Mojo a Truck stop and not a Village, Water is needed for the natural settlement of people, where there is no water, and life is strange. (Oops Las Vegas, Nevada.) The cultures develop in strange ways and in many ways confused. A lake is a big deal when you are surround by dust, however that does not mean the lake is something special. If my instincts are working correctly, Lake Ziway is just a lake in the middle of dry area of land with a lot of goats and donkeys. You can glamorize it all you want; this type of lake is an oversized mud puddle. I hope I am wrong. This is what I am anticipating, when a person feels they are surrounded by mud puddles, they tend to find big hotels or increase the speed of travel. I know when I am longing to live in a nice clean Hotel; I am trying to avoid the country. I expect the trip to Zee Why will take about three hours. The spelling of English words in Ethiopia is not helping me travel; I must continue check the pronunciation. 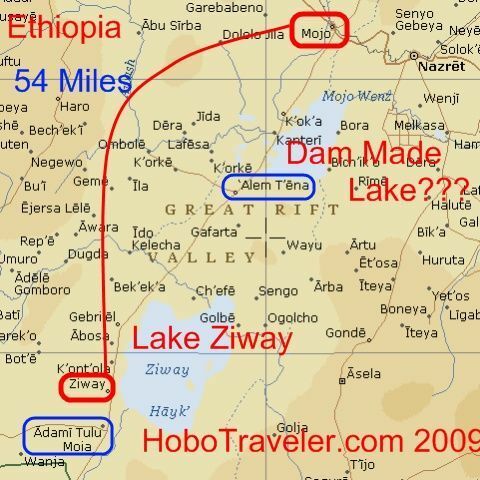 Fortunately, I can hold up the printed PDF file page of the Lonely Planet Guidebook and it has the word Ziway written in the Ethiopian language Amharic, pronounced Ah-Mar-ee.